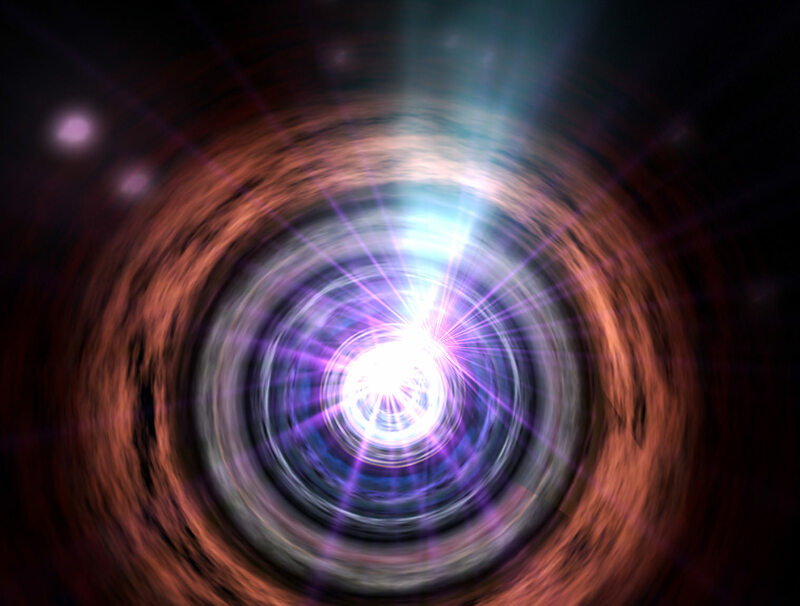 An exciting new discovery was unveiled early this week at the 223rd meeting of the American Astronomical Society being held in Washington D.C., when astronomers announced that a gravitational lens was detected for the first time at gamma-ray wavelengths. The study was conducted using NASA’s Fermi Gamma Ray Space Telescope, and promises to open a new window on the universe, giving astrophysicists another tool to study the emission regions that exist near supermassive black holes. But the hunt wasn’t easy. A gravitational lens occurs when a massive foreground object, such as a galaxy, bends the light from a distant background object. In the case of this study, researchers targeted a blazar known as B0218+357, a energetic source located 4.35 billion light years away in the direction of the constellation Triangulum. Blazar and quasar sources are named using their respective coordinates in the sky. Think of “0218+357” as translating into “Right Ascension 2 Hours 18 Minutes, Declination +35.7 degrees north” in backyard astronomer-speak. A blazar is a compact form of quasar that results from a supermassive black hole at the heart of an active galaxy. The term blazar was first coined by Edward Spiegel in 1978. The first quasar discovered was 3C 273 in 1970, which was also later found to be a blazar. 3C 273 is visible in Virgo using a large backyard telescope. A foreground spiral galaxy seen face on lies along our line of sight between our vantage point and B0218+357. At 4 billion light years distant, the two have the smallest angular separation of any gravitationally lensed system so far identified at less than a third of an arc second across. “We began thinking about the possibility of making this observation a couple of years after Fermi launch, and all of the pieces finally came together in late 2012,” said Naval Research Laboratory astrophysicist and lead scientist on the study Teddy Cheung in a recent NASA Goddard Spaceflight Center press release. Observations of the blazar suggested that it would be flaring in September 2012, making it a prime target for the study. In fact, B0218+357 was the brightest extra-galactic gamma-ray source at the time. Cheung was granted time spanning late September into October 2012 to use Fermi’s Large Area Telescope (LAT) instrument to study the blazar in outburst. Fermi‘s LAT instrument doesn’t have the resolution possessed by radio and optical instruments to catch the blazar in single images. Instead, the team exploited a phenomenon known as the “delayed playback effect” to catch the blazar in action. “One light path is slightly longer than the other, so when we detect flares in one image we try and catch them days later when they replay in the other image,” Said team member Jeff Scargle, astrophysicist based at NASA’s Ames Research Center. Cheung presented the findings of the study Monday at the American Astronomical Society meeting, which included three distinct flaring episodes from the background blazar that demonstrated the tell-tale delayed playback events with a period spanning 11.46 days. A Hubble Space Telescope image of the gravitational lensing of B0218+357. Credit: NASA/ESA and the Hubble Legacy Archive. Follow-up observations in radio and optical wavelengths supported the key observations, and demonstrate that Fermi’s LAT imager did indeed witness the event. Interestingly, the delay for the gamma-rays from the lensed blazar takes about a day longer than radio waves to reach the Earth. B0218+357 is also about four times brighter in gamma-rays than in radio wavelengths. This occurs because the gamma-rays are emanating from a slightly different region than radio waves generated by the blazar, and are taking a different path though the gravitational field of the foreground galaxy. This demonstrates that assets like Fermi can be used to probe the heart of the distant energetic galactic nuclei which harbor supermassive black holes. This opens the hot topic of gravitationally lensed blazars and their role in extra-galactic astronomy up to the gamma-ray spectrum, and gives cosmologists another gadget for their tool box. “Over the course of a day, one of these flares can brighten the blazar by 10 times in gamma-rays but only 10 percent in visible light and radio, which tells us that the region emitting gamma-rays is very small compared to those emitting at lower energies,” Said Stockholm University team member Stefan Larsson in the recent press release. Using the analysis of lensing systems at gamma-ray wavelengths will not only help to probe these enigmatic cosmological beasts, but it may also assist with refining the all-important Hubble Constant, which measures the rate at which the universe is expanding. But Fermi may just beginning to show its stuff when it comes to hunting for extra-galactic sources. The really exciting breakthrough, researchers say, would be the discovery of an energetic extra-galactic source being lensed by a foreground galaxy in gamma-rays that hasn’t been seen been seen at other wavelengths. This recent finding has certainly demonstrated how Fermi can “see” these tell-tale flashes via a clever method. Expect more news in the coming years! Read the entire paper on the arViv server titled Fermi-LAT Detection of Gravitational Lens Delayed Gamma-ray Flares from Blazar B0218+357.